Veal and mushroom stew, with just a touch of cream, is my idea of the perfect one-dish Sunday supper. Ladled over toasted country-style bread, this piatto unico is Italian comfort food at its best. Share at the table with people you love–or follow my Sunday routine and take a tray to the sofa for an episode of Downton Abbey or Breaking Bad. The dish is also good with lamb shoulder or stew meat, or you could substitute beef, but I prefer the delicacy of veal. 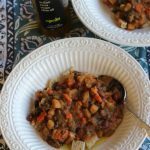 The recipe belongs to the spezzatino category of rustic, gently simmered stews. Italians would be more likely to serve the peas on the side, rather than as part of the stew. But I love the ease of one pour from the frozen-pea bag, and the pleasure of eating a few in every bite. Blot the veal shoulder dry with paper towels. Trim it, discarding the fat but reserving the bones. Cut the lean meat in 1/2-inch cubes. Over medium heat, heat enough oil (about 2 tablespoons) in a large straight-sided sauté pan. Cook the shallot and pancetta, stirring often, until the fat is rendered and the shallot and pancetta are lightly browned, about 5 minutes. Stir in the mushrooms, cooking until they soften and release some of their liquid, about 8 minutes. Add salt and pepper to taste. Scoop the contents of the pan into a bowl. Heat a little more olive oil (about 1 tablespoon) over medium-high heat in the same pan. Cook the veal (in batches, if necessary) until lightly browned; season with salt and pepper. Stir and continue cooking until browned all over. Lower the heat to medium. Sprinkle with the flour; stir for a minute or two. Add the wine, letting it sizzle while scraping the bottom of the pan with a spatula. Return the reserved veal bones (if any) and mushroom mixture to the pan, and add ½ cup water. When it comes to a simmer, reduce the heat to low and cook, partially covered, until very tender, about 1 ½ hours; add a little water from time to time if needed. When the veal is tender, remove and discard the bones (if any). Stir in the cream and peas, and cook a few minutes longer until the peas are cooked through and the sauce thickens slightly. Toast the bread until crisp but not browned; slice in half diagonally. To serve: Arrange two toast halves in the center of each plate. Spoon the stew on top, letting it cascade over the sides of the toast. Cedar Key, a charming town three hours north of Tampa Bay that once dubbed itself “the Venice of America,” ships farm-raised clams all over the country. So it’s a great place to indulge in steamed clams, fried clams and, of course, clam chowder. My husband and I hadn’t come here just for clams. After spending a weekend celebrating a friend’s birthday, we returned to this unspoiled fishing village on our own for a restorative visit. Cedar Key pleasures are simple but sufficient: Wander down the two-block main street, stopping at the visitors’ center to bone up on the town’s 19th-century heyday as a center for oystering, shipping and manufacture of red cedar slats for pencils. Check out the excellent artists’ coop. Walk the abandoned rail line, now given over to songbirds and native plants. Watch sunsets over the island-strewn bay. across flats and into gorgeous estuaries in his air boat. We caught a zillion redfish, all of which failed to meet the 18-inch limit, but they were feisty and that’s what counts with fishing. Capt. Robinson is the fourth generation of fishermen in his family and figures he’ll be the last–his son decided to take up house painting instead. The mixed seafood platter at Tony’s was tasty–fried fish, steamed clams, broiled sea scallops and other delicacies I could imagine eating on the coast of Italy. 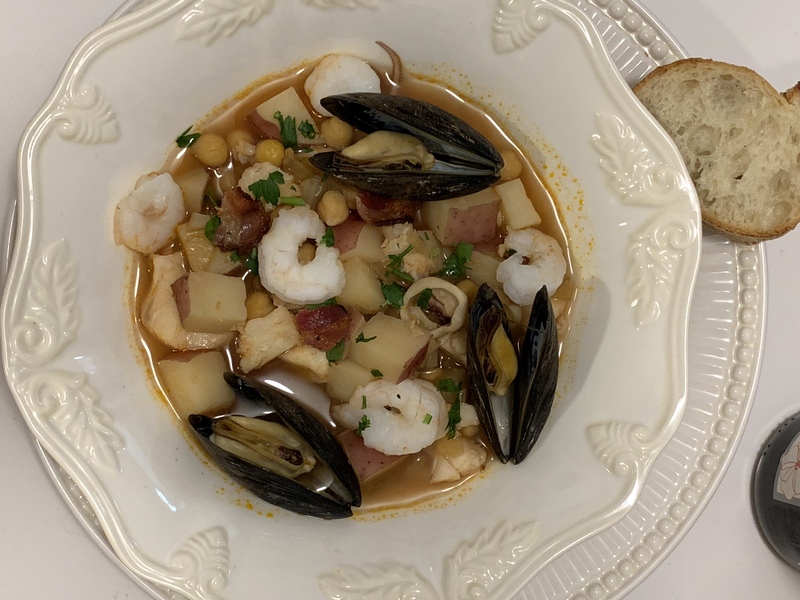 What the restaurant is really known for, though, is its “World Champion clam chowder,” winner of a national competition three years in a row. I’ve eaten it, but…eh. I have to say that rich, creamy chowder is not to my taste. So, instead of stocking up on Tony’s chowder, I bought a 12-pound sack of Cedar Key clams to take home. I had a choice of small, medium and large–and took the advice of the guys on duty, who insisted that the larger ones, though a little more expensive, are a better value. Then I set out to make clam chowder. The so-called Manhattan kind, with tomatoes but no béchamel sauce or cream. Inevitably, I headed in an Italian direction, using olive oil, wine and a good brand of imported plum tomatoes. And why use salt pork when pancetta would be so much better? The clam chowder was good and, as I hoped, light enough for the shellfish flavor to shine through. No need to return to Cedar Key if I make it again–the town’s clams are available here in St. Petersburg. But I have plenty to other reasons to go back. Scrub the clams to remove sand. Combine 2 quarts water with 1 tablespoon salt in a large bowl. Stir until it dissolves. Add the clams (add more water if necessary to submerge). Let stand for 2 hours to expel any sand. Lift the clams out of the water and combine in a large skillet with the wine and 1/2 cup water. Steam, covered, removing them as the shells open. Cool, remove the clams with a spoon and roughly chop them. Sauté the onion and pancetta with the olive oil in a medium saucepan until lightly browned. Stir in the tomatoes, potato and celery. Using a fine-mesh strainer, strain the clam broth into the saucepan and add enough water to cover the vegetables with a few inches to spare. Bring to a simmer and cook for a few minutes. Add salt and pepper to taste. Continue cooking until the potato is tender. Stir in the chopped clams and parsley (if using) shortly before eating. Serve with water crackers or, better yet, taralli. Note: For a thicker consistency, stir in a little cornstarch dissolved in water toward the end of cooking. 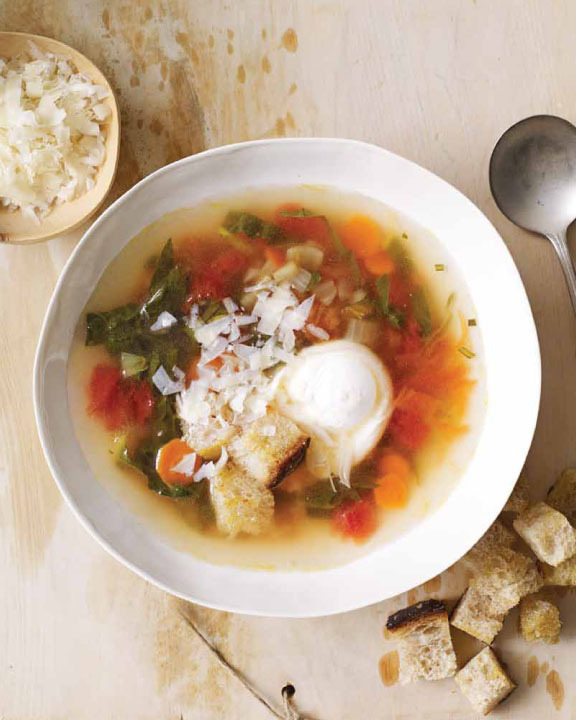 In the Piemonte region of northern Italy where Margherita Aloi grew up, this potful of spring greens in broth, thickened by fat rice kernels and potatoes, is known as a “cleansing soup”…especially for women. I’ve never been altogether sure what “cleansing” means, but it likely has something to do with the greens, rich in digestion-enhancing fiber, and with the idea of giving the female reproductive system a tune-up during the season of rebirth. Anyway, it is a wonderfully nourishing spring dish, and I love the idea of a soup made by women, for women. 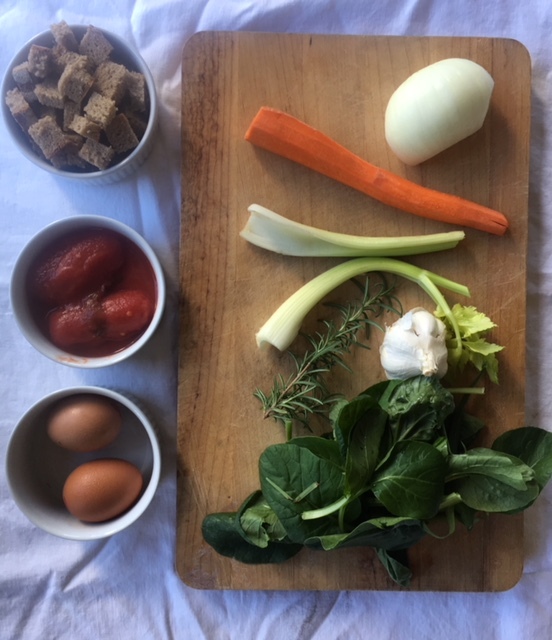 According to Margherita, who eventually became a Connecticut chef, this traditional soup made sense not only because greens and young onions are spring crops, but because this was the time women were working in the rice fields. A woman could make a big batch ahead of time and then at night, when she was stanca morta–dead tired–simply heat it up. Before automation, women were considered perfect for rice-field duty because they had the small hands (and patience?) to plant and cultivate the seedlings. For a glimpse of gritty realities guaranteed to blast away nostalgia for that hard-scrabble era, I recommend Bitter Rice (Riso Amaro), a neo-realist film of the ’40s. 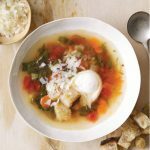 As a simple meal made with inexpensive ingredients, Margherita’s spring greens and rice soup is squarely in the cucina povera tradition, and I included the recipe in Piatto Unico, my cookbook on Italian one-course meals. Its comforting flavors remind me a bit of my mother’s potato soup. Hers was a more rudimentary soup–just potatoes, onions and water, seasoned with a dollop or two of butter plus salt and pepper. My mom told me that, living on an Army base during World War II, she and my dad ate potato soup toward the end of the month while waiting for the next paycheck and round of ration cards. But she remembered early marriage as a happy time and that association may explain in part why she went on making potato soup throughout her life. dandelion greens at my Florida farmer’s market, along with organic nasturtiums to float in the bowls. Leaving small leaves whole, thinly slice the other greens (makes about 10 cups). Heat a large saucepan over medium-low heat. Combine the leeks and garlic with the olive oil, stirring until coated. Cover the pan and cook, stirring often, until they soften but do not brown, about 10 minutes. Add the potatoes and cover with broth (if using water, add 1 tablespoon salt). Bring to a boil; reduce the heat and simmer, partially covered, until barely tender. Stir in the rice and cook until al dente, about 10 minutes. Add the asparagus, hot red pepper, and shredded greens. Season with salt and simmer just until the greens are tender (add more water as necessary for a soupy consistency). Serve the soup warm, topping each serving with a thread of olive oil and sprinkle of cheese. Pass the rest of the cheese at the table. Everybody grabs recipes off the Internet (me included) but let’s agree that, when gift giving time comes around, most of us would rather receive a cookbook than a pile of printouts. 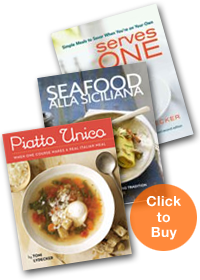 The fact that I’m a cookbook author influences my point of view, of course, but right now I’m here to talk about other Italian cookbooks (hoping, optimistically, that you already own mine). Here are three worth giving to someone on your list–or adding to your own library. One of the best new reads–especially for jaded Italophiles who think they’ve seen it all–is SPQR: Modern Italian Food and Wine. Authors Shelley Lindgren and Matthew Accarrino are the wine director and executive chef, respectively, of SPQR in San Francisco. They’ve chosen as a theme to take readers down the ancient Roman roads of central and northern Italy, collecting recipes and stories along the way. Rather than a reverent sharing of traditional dishes, however, this is an exuberant mash-up of recipes that draws on molecular cooking techniques and ingredients from the global larder. I couldn’t stop staring at the stunning but strange photo of fluke crudo studded with citrus segments and sausage-stuffed olives. I look forward to experimenting with a waxy powdered olive oil said to be “a simple, modern twist that brings out the oil’s floral flavor without an oily texture.” SPQR also contains useful chefs’ tips such as floating a parchment paper lid on simmering beans to seal in moisture. But finding a dish I could put together without considerable advance work: That was tough. In a ricotta fritter recipe, for instance, the traditional sweets are spiced with curry powder and fennel pollen, and served with smoked maple syrup. Smoked maple syrup? It requires a stovetop smoker, also needed for a smoked linguine recipe (the technique emulates flour milled from charred grains in Puglia, Accarrino’s family homeland). A stovetop smoker, if I had one, would likely set off the fire alarm in my condo. Nor do I own a spaetzle maker or the immersion circulator and vacuum sealer needed for sous vide cooking. Fermented black garlic, frozen huckleberries, nettle leaves and xanthan gum are among the ingredients that pose sourcing challenges. I enjoyed reading this book, but instead of pushing me toward the kitchen, it made me feel like booking a flight to San Francisco for dinner at SPQR. Hazan Family Favorites falls at the other end of the cookbook spectrum–no earth-shattering culinary news here but this collection of appetizing dishes gently invites readers into the kitchen. 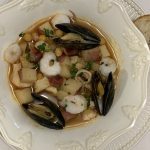 My education in Italian cooking started way back with Marcella Hazan’s ground-breaking books and her son Giuliano is carrying on the family tradition in fine fashion. In this family album-style cookbook, he includes the recipe for the veal rolls Marcella once served food editor Craig Claiborne, setting her on a path to culinary fame. Marcella’s four-ingredient butter, tomato and onion sauce is also here. Along with his wife Lael’s meatloaf, Giuliano offers intriguing recipes such as mahshi (lamb-stuffed cabbage leaves) that reflect his grandparents’ experience as Italian expatriates living in the Middle East. Okra with fresh tomatoes is not typical Italian fare, either, but Giuliano remembers eating it for the Shabbat meal served every Friday night. Strictly speaking, The Country Cooking of Italy is not new—it came out at the end of 2011—but this hefty volume, filled with evocative photographs of country dishes and scenes, remains impressive. Author Colman Andrews set out to recreate simple, robust dishes of farms, villages and provincial towns throughout Italy. re obscure dishes such as salamareci, a cold tomato soup (related to gazpacho) I’d tasted in Sicily and a Calabrian marinated lettuce dish called mappina (“dishrag,” alluding to the limp greens). His recipe for orecchiette with broccoli rabe matches up exactly with the one my friend Maria makes—and no wonder. She’s from Puglia, and so is this recipe. 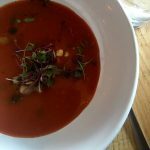 Some recipes, such as the Tyrolean ham-dumpling soup from Alto Adige, were completely new to me. And until now I’d never made peposo, a dead-easy Tuscan beef stew with a crazy amount of black pepper and garlic. Put the beef and garlic into a Dutch oven or other heavy ovenproof pot, sprinkle with the peppercorns and season generously with salt. Spoon the tomato sauce over the top, then pour in enough wine to barely cover the ingredients (you may not need the full amount). Place the lid on top. Bake for 6 hours without uncovering the pot. The meat should be very tender and the sauce very thick. Continue baking for 1 to 2 hours more if necessary. Serve over bruschetta, if you like. * The recipe calls for 2 tablespoons of crushed peppercorns but I started with 2 teaspoons and, after tasting later, decided that was enough. ** If you use an earthenware pot, as I did, start the cooking in a cold oven.